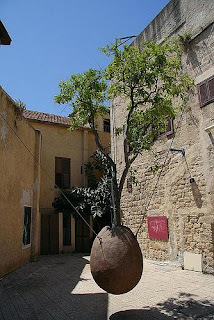 As you can see in the picture at the start of this post (credit: found it here), a large container of soil hangs, suspended, in the middle of a courtyard, and a large tree grows out of that container. Walking down an alley and suddenly encountering this large, floating refugee from a JNF forest, is a surreal experience. I also saw the tree on a previous trip, but – like any good work of art – it hit me differently, and more powerfully, the second time. I have spent a lot of time thinking about it over the past few days, and about why it so moved me now. The tree seemed lonely to me, hauntingly isolated not only from other trees, but also from the nourishing and secure soil which is its right, by dint of its very identity. A tree out of soil, a fish out of water... a Jew out of his homeland. Rootbound in its cramped container, suspended between heaven and earth, lacking the security and comfort and nourishment of soil, that tree nonetheless continues its existence daily, gives shade, provides a resting place for a passing dove. This is the life it knows. But what if its life were different? What if there were other hanging trees in the courtyard, sharing suspended soil with our lonely tree? What if she knew the company of others of her kind, likewise bereft of space for their roots, secure footing for their trunks? And so the hanging tree became, for me, in the course of visits to Beit haTefutsot and Beit Guvrin, the Palmach and Yad VaShem, in the course of listening to Aluf Benn and Rabbi Melchior, in the course of praying by a roadside in Yoav and by the Wall at sunrise, a central theme of my experience on this trip. I am very much a hanging tree, doing my best to thrive even though my roots are cut off from the land which should be theirs. So are all of us in the Diaspora, hanging trees whether we know it or not, whether we feel it or not. And, yes, even in Israel the Jew is a hanging tree, suspended in that courtyard, at home geographically but still seeking meaning, seeking needs both physical and spiritual, seeking the company of others. Rabbi Soloveitchik wrote of “The LonelyMan of Faith,” seeking Gd in the universe – but we also seek each other. We are all hanging trees – but when we join together as our group did in this trip, to feed the hungry, to offer succor to people living under threat of rockets, to honor the memory of those who have passed and to encourage those who are building the future, then our hanging trees become a hanging forest, planted in common soil. May we plant many more trees, hanging and otherwise, in the future. Want help cheating on your taxes, Rabbi?